The SIGNAL Event Analyzer represents a breakthrough in the analysis of repetitive acoustic events as diverse as field recordings of birdsong, laboratory ultrasonic rodent vocalizations, and industrial monitoring of rotating machinery. It can go automatically from raw acoustic data to summary behavioral acoustic measurements and statistics, such as call rate, call duration, intercall interval, peak frequency, frequency range, etc. Compared to manual event editing and measurement, the Event Analyzer allows the researcher to investigate many more acoustic parameters for significant effects, with a much larger data sample, and, if desired, over a much longer time period. 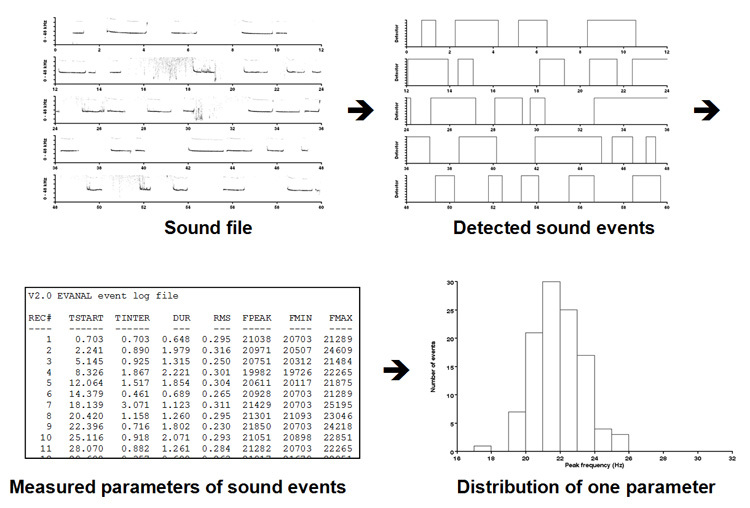 The Event Analyzer begins with a continuous digitized sound file containing the input audio stream, automatically detects all events of a specified character, measures a suite of event parameters (including time of occurrence, event duration, principal event frequency, and FM frequency range), stores these parameters in a data file, then produces summary statistics and histogram displays for a variety of parameters over the entire data set. There is virtually no limit on the size of the input sound file, so the analysis period can be very long. The Event Analyzer automates and integrates the separate processes of event detection, event measurement, and statistical analysis and display. It reduces these processes to a collection of menus, configuration settings, automatic and interactive measurements, diagnostic tools, statistical analyses, and histogram displays, saving the user potentially months of custom programming. Internally, the Event Analyzer utilizes the SIGNAL Event Detector and a variety of analysis tools from SIGNAL, and the user must have both SIGNAL and the SIGNAL Event Detector in order to use the Event Analyzer. The user digitizes sound material into an extended sound file, typically using SIGNAL, then configures EVDET for the desired event characteristics. EVDET processes the entire sound file automatically, detecting occurrences of the characterized event type and performing measurements on each event. EVDET produces an event log file containing event times and measurement results, and optionally saves the detected event as individual SIGNAL sound files. EVDET also provides modeling and display tools to visualize and refine detection parameters. EVANAL then processes the EVDET output file for statistical analysis and display. EVANAL statistics can be individually configured, then selected for screen display or printing. Automatic vs. semi-automated mode: The Event Analyzer can be run in two modes. Automatic mode detects and measures all events in the input file without user intervention. Semi-automated mode allows the user to adjust measurement results, and is useful for monitoring the measurement process and for difficult or noisy source material, on which each detection must be checked and possibly adjusted. Event log file: The Event Analyzer measures a number of sound parameters for each detected event, such as time of occurrence, event duration, and peak frequency. These parameters are written to a data file called the event log file for later statistical analysis. The log file is normally processed by the Event Analyzer, but it can also be analyzed by a spreadsheet or other statistical program. Statistical display: After all events in the input sound file have been detected and measured, the Event Analyzer compiles statistics on each measured input parameter. These parameters include event duration, inter-event interval, RMS level, peak frequency, and frequency range (see figure). The Event Analyzer can then display and/or print a distribution histogram or other display for any of these parameters over the input data set. This is illustrated in the following examples. Call rate: Call rate is the number of calls detected within a specified time interval, such as one minute. The data set is partitioned into a sequence of intervals and the number of calls in each interval is counted. The Event Analyzer will display a histogram of call rates and report the mean call rate. Call duration: Call duration is the duration in seconds of each event. The Event Analyzer will display a histogram of call durations and report the mean call duration. Peak frequency: Peak frequency is the frequency value at which the power spectrum of the event achieves its maximum value. The Event Analyzer will display a histogram of peak frequencies and report the mean peak frequency. Frequency range: Frequency range is the difference between the minimum and maximum frequencies present above a specified level in the power spectrum of the event. The Event Analyzer will display a histogram of frequency ranges and report the mean frequency range.